George Duffield has retired from the saddle after failing to recover from an injured shoulder. Duffield, 58, rode his first winner in 1967 and is 10th in the all-time jockeys' list with 2,547 victories. "I have not ridden a race since last July and I have enjoyed being at home and being busy," said Duffield. "I will help Anne (his wife) with training the Flat horses, and can still ride out so that will be another phase of my career." Duffield's major triumphs included the Oaks, Irish Oaks and St Leger of 1992 on the Clive Brittain-trained User Friendly. 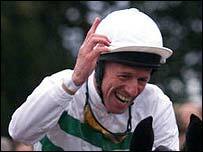 Duffield, who sustained the injury when a horse reared up on him in the stalls last July, also received an MBE in 2003 for his services to horse racing. The Yorkshireman first moved to Newmarket to join Jack Waugh's stable as an apprentice in 1962. But his career really took off after linking-up with another Newmarket trainer, Sir Mark Prescott. The pair won over 830 races together over 31 years, mostly at the lower end of the scale. But they also had wins in big handicaps, such as when Pasternak landed the Magnet Cup and Cambridgeshire in 1997. They also took the Champion Stakes in 1998 and 1999 with Alborada. Duffield recorded the first of his two centuries in 1992 and the second the following year for his highest-ever total, 116. He also won the Racing Post Trophy on Aristotle and the Eclipse Stakes on Giant's Causeway for top Irish trainer Aidan O'Brien. "I suppose winning the Oaks on User Friendly in 1992 was a highlight of my career as there is nothing like riding a Classic winner," said Duffield. "I was also with Sir Mark Prescott for 30 years, and I am going to Newmarket soon to have dinner with all the owners. "But at least I am not the oldest jockey in the weighing room any more, and neither is Pat Eddery. I suppose it must be someone like Kevin Darley now."